Orange azalea grows 8-10 ft. high and forms a rather loose, multi-stemmed shrub. Twigs are reddish- brown in the winter. 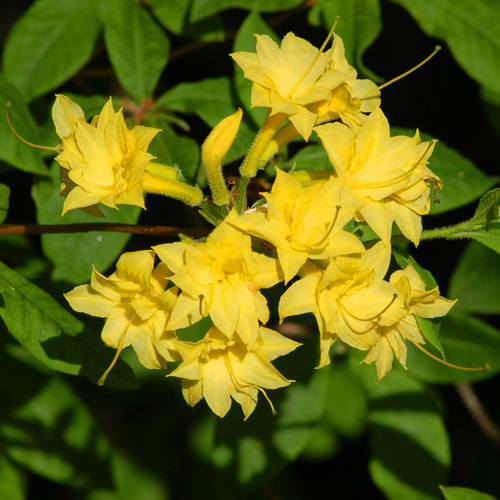 The fragrant, yellow, orange or almost pure red flowers occur 8-15 together. Flowers are tubular in shape with protruding stamens and open before or with the leaves. Duration: Perennial Habit: Shrub Leaf Retention: Deciduous Leaf Arrangement: Alternate Leaf Complexity: Simple Breeding System: Flowers Bisexual Size Class: 6-12 ft.